New online matchmaking "a step up". THQ's decision to ditch Games for Windows Live in favour of Steam for real-time strategy game Dawn of War II - Retribution boosted sales, the publisher has said. "Going exclusive through Steam helped drive awareness with their millions of users by way of banners and message support so by the time we opened the beta up to all Steam customers, we had a huge number of people playing," THQ director of global brand management Georgina Verdon told the[a]listdaily.com. "At the very tail end of the beta we partnered with Justin.TV and some of their top StarCraft players, who held several live streaming broadcasts of the Retribution MP beta and single-player campaign mode to a receptive StarCraft fan base. This hype and activity helped us exceed our digital pre-order forecast by 129 per cent." 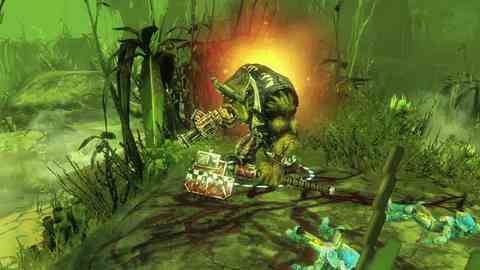 Retribution is the standalone expansion to 2009's excellent Dawn of War II. Al Bickham micro-managed an 8/10 in Eurogamer's Dawn of War II - Retribution review. Last year THQ announced that the game would drop the GFWL multiplayer platform for Steamworks – a move that pleased many players. "The content of the game wasn't dependent on the online service provider," Relic producer Jeff Lydell said. "However, one of our goals when making expansions to our games is to address problems in the original. "The combination of requiring both a Steam account and a Games for Windows Live account had been a source of frustration for many of our players, so we took the necessary steps to fix that. We also got to take full advantage of the Steamworks SDK features like cloud saving." He continued: "The new online matchmaking experience is definitely a step up in many player's eyes. The new skill rating system gives better granularity on ladder standings, and makes it easier to see the changes in rating after a match. The Steam community features for organizing friends lists are all frequently used, and there are many groups with active users, as well the in-game chat lobby is always active with players. "There was a lot of concern the move away from our previous expansion strategy would fragment the community. Looking at the numbers, it's clear most active players have moved over to Retribution, and the total hasn't gone down."